A regular breeding resident and migrant; the LeConte’s Sparrow was an uncommon species during the Minnesota Breeding Bird Atlas (MNBBA). Restricted largely to the interior Canadian provinces of Alberta, Saskatchewan, and Manitoba, the species’ breeding range also dips into eastern North Dakota, northeastern South Dakota, northern Minnesota, northern Wisconsin, and the Upper Peninsula of Michigan. Small, localized populations occur elsewhere, including British Columbia, Quebec, and Ontario. An uncommon species throughout its breeding range, it is found in relatively high abundance in northwestern Minnesota (Figure 1). A short-distance migrant that winters in the south-central United States. An omnivorous ground forager that consumes insects and seeds. An open-cup nest located on or just above the ground. Breeding distribution and relative abundance of the LeConte’s Sparrow in North America based on the federal Breeding Bird Survey, 2011–2015 (Sauer et al. 2017). In the revised, second edition of The Birds of Minnesota, Roberts (1936) noted that Gustave Swanson had found LeConte’s Sparrows to be common in the “extreme northern part of Koochiching County.” This record extended the species’ breeding range much farther east into the “Canadian Zone” than Roberts originally noted. In 1959, Dwain Warner, the Bell Museum’s curator of ornithology, published a small update on the status of the species (Warner 1959). Knowing that Roberts had described the species as a summer resident throughout all but Minnesota’s northern forest region, Warner commented on the recent paucity of LeConte’s Sparrow records. Although the museum and its staff had received thousands of observations of Minnesota birds since Roberts’s 1932 publication, there were only 12 breeding season observations of LeConte’s Sparrow, stretching from Steele County in southeastern Minnesota northwest to northern Roseau County. In the years that followed, a few more efforts to locate the birds were successful. A small population was found in southern St. Louis County in 1962 (Kuyava 1962), and the birds were documented at numerous localities in northwestern Minnesota by David Parmelee and his students during the summers they spent at the Lake Itasca Biological Station. Not only were birds found in Itasca State Park, they were also quite common in the wet meadows west of the park and to the southeast, in Wadena County. Then in 1972, Parmelee and his colleague, Richard Oehlenschlager (1973), located 1 nest with 3 large young in the county in 1972 and 2 nests with 5 eggs in 1973. This was the first confirmed nesting occurrence (nest with eggs) since Roberts (1932) confirmed nesting in Kittson County in 1929. When Green and Janssen (1975) published their updated account on the species’ status a few years later, they described the sparrow’s range as limited primarily to the state’s northwestern region, though it was occasionally found in suitable habitat south through central Minnesota. Although they noted a 1928 record of juveniles from Jackson County on the Iowa border, that was not included in Roberts’s (1932) account, there were no current records in the southern counties. Janssen (1987) elaborated on the species’ distribution a few years later, describing it as a “common and widespread” species in central and northern Minnesota. It could be found as far south as Pine, Sherburne, and Stearns Counties in the east, and Wilkin and Clay Counties in the west. The species appeared to have receded, however, from the southern periphery of its range in the state. Janssen noted that it was formerly found south to Lac qui Parle County in the west, and to Dakota County in the east. Yet, by the late 20th century, there were only 3 summer observations from Hennepin, Lincoln, and Lyon Counties in the southern region. Since 1970, nesting had been confirmed in only 4 counties: Aitkin, Beltrami, Marshall, and Wadena. By 1998, Hertzel and Janssen added 2 additional counties to the list, Becker and Red Lake. Parmalee and Oehlenschlager’s 1972 and 1973 nesting records from Wadena County, however, were not included on their map of confirmed nesting records since 1970. Work conducted by field biologists with the Minnesota Biological Survey beginning in the late 1980s provided the first comprehensive assessment of the LeConte’s Sparrow’s distribution in Minnesota. A total of 464 breeding season locations were documented. At the time, suitable habitat in the Northern Minnesota and Ontario Peatlands Section had not yet been surveyed. Aside from 2 breeding season observations along the Minnesota River valley in Lac qui Parle and Nicollet Counties, the species was restricted to the northern half of the state, from Stearns and Stevens Counties north to the Tallgrass Aspen Parklands Province in the northwest, and to west-central Lake County in the east (Minnesota Department of Natural Resources 2016). MNBBA participants reported 664 LeConte’s Sparrow records in 9.4% (445/4,752) of the surveyed atlas blocks and in 11.8% (276/2,337) of the priority blocks. Breeding evidence was documented in only 4 atlas blocks (Figures 2 and 3; Table 1). The birds were observed in 45 of Minnesota’s 87 counties and were documented breeding in 3 counties: Aitkin, Kittson, and Roseau. The sparrow was most abundant and widely distributed in the Tallgrass Aspen Parklands Province but was common also in the wet prairies of the Glacial Lake Agassiz beach ridges in the Red River valley and in the extensive sedge wetlands of Aitkin County. Aside from a few records near or adjacent to the Minnesota River valley, LeConte’s Sparrows were entirely absent from the southern third of the state. Although Roberts (1932) characterized the sparrow as a species found throughout the state’s prairie region, he provided no documentation of its occurrence south of the Minnesota River. Only the 1928 Jackson County record noted by Green and Janssen (1975) provided evidence of its former occurrence in the region. Indeed, since Warner’s brief assessment of the species’ distribution in 1959, it appeared that the species had always been restricted to the northern two-thirds of the state. Records in the northern forested region of the state likely do not represent an expansion of the species’ range but rather documentation that the species can be found in the wet sedge meadows and open peatlands that are scattered throughout this region. Atlas data were used to generate a predicted breeding distribution map for the species (Figure 4). The Tallgrass Aspen Parklands Province and the glacial beach ridges of the Red River valley support the core of the species’ range in the state. The model also predicts that suitable habitat to support low breeding densities may be found in scattered wetlands not only across central and north-central Minnesota but also in the southwest and southeastern regions. Lowther’s (2005) comprehensive review of the species makes no note of wide-scale changes in the species’ distribution other than a passing reference to the fact that it was formerly a rare breeder in northeastern Illinois. Wisconsin’s first breeding bird atlas (1995–2000) documented LeConte’s Sparrow records in scattered locations throughout the northern third of the state and a few records farther south in the central region (Cutright et al. 2006), including a confirmed breeding record as far south as Marquette County, directly east of La Crosse. The species is also uncommon and sparsely distributed in Michigan, where the first atlas (1983–1988) reported records in 30 townships, all restricted to the Upper Peninsula. During the state’s second atlas (2002–2008), reports were documented in 51 townships, including 5 in the northern Lower Peninsula (Chartier et al. 2013). Records also increased in Ontario during its second atlas (2001–2005), when the probability of detection more than doubled since the first atlas was conducted (1981–1985; Cadman et al. 2007). In South Dakota, only 3 birds were encountered during the first atlas (1988–1992), compared to 83 during the second atlas (2009–2012) (Drilling et al. 2016). Breeding distribution of the LeConte's Sparrow in Minnesota based on the Breeding Bird Atlas (2009 – 2013). Summary statistics of observations by breeding status category for the LeConte's Sparrow in Minnesota based on all blocks (each 5 km x 5 km) surveyed during the Breeding Bird Atlas (2009-2013). Summary statistics for the LeConte's Sparrow observations by breeding status category for all blocks and priority blocks (each 5 km x 5 km) surveyed during the Minnesota Breeding Bird Atlas (2009-2013). Predicted breeding distribution (pairs per 40 hectares) of the LeConte's Sparrow in Minnesota based on habitat, landscape context, and climate data gathered during the Minnesota Breeding Bird Atlas (2009-2013) using the General Linear Modeling method with an adjustment for detectability. Historically, the breeding habitat of the LeConte’s Sparrow was always described as low, wet grassy meadows and prairies (Figure 5). As early as 1901, Peabody described the species’ habitat in Kittson County as the lowland sections of open prairie where there was “luxuriant growths of heavier grass and vetch” (Peabody 1901). And, as noted earlier, Roberts (1932) characterized the bird as an inhabitant of wet, boggy marshes, wet meadows, and low-lying prairies. Often the birds were described as occupying the drier edges of such wet areas (Walkinshaw 1968). In Minnesota’s peatlands, LeConte’s Sparrows were found in more open areas with a “high density of sedges, moderate forb densities, and low overall vegetation heights” (0.9 m overall height of predominant vegetation) (Dechant et al. 2002; Niemi 1985). Over the years, however, it became clear that the species could also be found in drier upland sites, including hay pastures, fallow fields, and planted cover in Conservation Reserve Program (CRP) fields. Indeed, a study in Pine County in 1983 documented a total of 24 nesting territories, only 2 of which included more than 60% wet grasses. The other 22 territories were located in fallow fields, annually mowed hayfields, and in an overgrown sunflower field (Cooper 1984). Fallow fields were favored by the majority of birds, and these were often near marshes or open water. In northern Wisconsin, Robbins (1991) found the birds in sedge meadows and bogs as well as fallow fields and pastures. An intensive study of CRP fields in Minnesota, South Dakota, and North Dakota also found the birds regularly using these planted, perennial grasslands, particularly in years with wet conditions (Igl and Johnson 1995; Igl 1996). Other field studies in North Dakota found LeConte’s Sparrows in pastures with shorter vegetation (.4 m in height) than they were found using in Minnesota peatlands (Dechant et al. 2002). Despite the diversity of sites utilized, they usually share four primary characteristics: (1) open and level terrain, (2) relatively undisturbed grass and/or sedge cover, (3) moderately tall, dense vegetation, and (4) abundant residual vegetation (Dechant et al. 2002; Sample and Mossman 1997). When dry upland sites are used, the birds prefer less intensively managed sites and those where woody cover is absent or sparse (Sample and Mossman 1997). Moderate ground cover, sufficient to provide some protection from predators but open enough to benefit this ground-foraging species, was one of the best predictors of nesting densities (Winter et al. 2005). Strongly responsive to wet conditions, the birds show a low degree of site fidelity depending on moisture conditions. Few studies have closely examined LeConte’s Sparrow’s area sensitivity (Dechant et al. 2002). In Wisconsin, biologists believe the species is more reliably found in large sites even though they can be found in agricultural lands 8 ha or smaller in size (Kreitinger and Paulios 2013). In North Dakota, biologists found some degree of area sensitivity (Johnson and Igl 2001). Habitat data gathered within 200 m of MNBBA point counts where LeConte’s Sparrows were detected illustrate the dominance of upland grassland habitats (both dry and mesic). Shrub wetlands and wet meadows comprised a much smaller percentage of the habitat (Figure 6). Typical breeding habitat of the LeConte’s Sparrow in Minnesota (© Gerald J. Niemi). Habitat profile for the LeConte's Sparrow based on habitats within 200 m of point counts where the species was present during the Minnesota Breeding Bird Atlas (2009-2013). Using data gathered by the federal Breeding Bird Survey (BBS), Partners in Flight estimated the North American population of LeConte’s Sparrows at 8 million breeding adults in 2013, only 700,000 of which were estimated to occur in the United States (Partners in Flight Science Committee 2013). By 2016 the North American population estimate had been decreased to 5.2 million (Rosenberg et al. 2016). In 2013 Minnesota was estimated to support 5.2% of the continental population, or approximately 400,000 birds; today that estimate would be closer to 270,000 birds. The statewide population estimate using MNBBA data is 603,000 breeding adults (95% confidence interval of 429,000 – 2.2 million). Although Minnesota is on the southern periphery of the species’ breeding range in North America, the northwest corner of the state supports relatively high breeding densities (Figure 1). Along all BBS routes in Minnesota, observers report an annual average of less than 1 bird per route (0.78). When just the 4 routes that occur in Kittson and Roseau Counties are examined, the average is considerably higher, at 8 birds per route, ranging from a low of 7 to a high of 11; throughout the entire Tallgrass Aspen Parklands Province (6 routes), the average is 6 birds per route. The average for the entire United States is less than 1 bird per route (0.37), and in the heart of the species’ range in Alberta, Canada, observers report an average of 7 birds per route (Sauer et al. 2017). Clearly, northwestern Minnesota provides critical habitat for the species. Nesting densities appear to be strongly influenced by moisture conditions (Dechant et al. 2002). A study of CRP fields in the northern Great Plains from 1990 to 1994 included four seasons (1990–1993) of drought and one year (1994) of wet conditions. The birds showed a dramatic response to precipitation levels on three of the nine study sites. Sparrows were initially absent from all three sites in 1990 and were present at very low breeding densities (0.01 to 0.12 pairs per 40 ha) from 1991-1993. Then, during 1994, breeding densities rose dramatically, ranging from 1.1 to 8.6 breeding pairs per 40 ha (Igl and Johnson 1995). Ten years later, Winter and his colleagues (2005) examined the habitat and nesting ecology of LeConte’s Sparrows in northwestern Minnesota and northeastern North Dakota from 1998 to 2001. Mean breeding densities over the four-year study averaged 17 pairs per 40 ha, varying considerably from site to site and year to year. Although the densities were not dissimilar on some sites to those reported by Igl and Johnson during the wet year of 1994, they were significantly higher than previously reported densities in North Dakota, which averaged less than 2 breeding pairs per 40 ha (Winter et al. 2005). It is likely that annual climatic conditions are largely responsible for these discrepancies. In the Red Lake Peatlands of north-central Minnesota, field studies documented much higher breeding densities of 65 pairs per 40 ha in open fens, 28 pairs per 40 ha in open bogs, and 29 pairs per 40 ha in shrub swamps (Nevers et al. 1981). A species so responsive to annual precipitation likely shows wide population fluctuations at the national level as well. Indeed, since population monitoring began in 1966, the LeConte’s Sparrow population trend has been quite erratic but demonstrated a long-term decline of 2.59% per year (Figure 7). 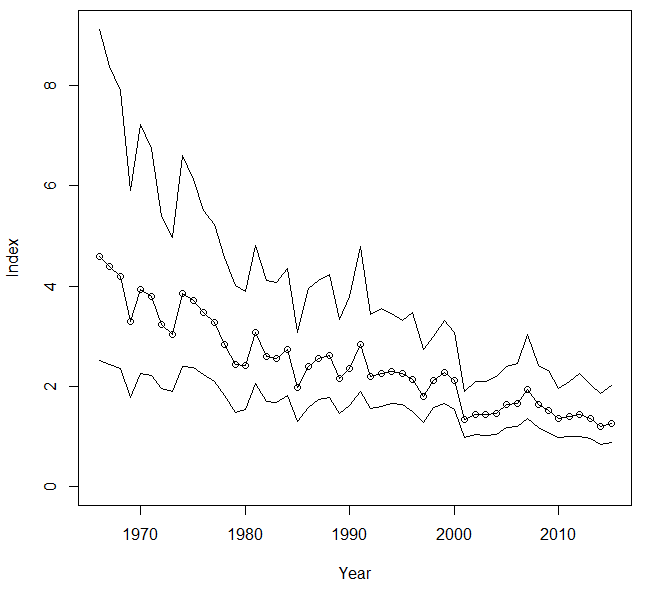 The species’ relative abundance in Minnesota is too low to generate a reliable population trend line, but BBS data suggest a declining population (Sauer et al. 2017). Because the sparrow is a wetland-dependent species, the survey-wide decline was not surprising given the well-established loss of wetlands across North America. Breeding population trend for the LeConte’s Sparrow in North America for 1966–2015 based on the federal Breeding Bird Survey (Sauer et al. 2017). This shy and secretive little bird has received conservation attention at both the state and federal level. In Minnesota it has been designated a Species in Greatest Conservation Need (Minnesota Department of Natural Resources 2015). At the national level it is classified by the International Union for Conservation of Nature as a G4 species, or a species Near Threatened (NatureServe 2015), and has been assigned a Continental Concern Score of 12/20 by Partners in Flight (Rosenberg et al. 2016). Its declining population is considered the most significant threat. Controlling succession to prevent woody encroachment is the primary management action necessary to ensure a site remains suitable for LeConte’s Sparrows. Burning or mowing every two to four years is recommended (Dechant et al. 2002). Because the species depends on tall, dense vegetation (0.4 to 0.9 m) with moderate amounts of residual cover, it is important to manage large sites in units that allow at least half of each parcel to be maintained in older cover. Equally important is the need to provide an adequate litter layer. As Winter and his colleagues (2005) pointed out, the species requires a moderate amount of litter; too little or too much renders a site unsuitable. A study in Minnesota in the 1960s demonstrated that sites were most suitable the second year after a burn, resulting in a moderate layer of litter and abundant new growth (Tester and Marshall 1961). Subsequent field studies in North Dakota demonstrated the birds were most abundant on sites two years after they were burned, and they avoided unburned sites (Madden 1996; Madden et al. 1999). This secretive bird, whose insect-like song goes undetected by many, may have an uncertain future. The LeConte’s Sparrow is located on the southern periphery of its range in northern Minnesota, and this could be where changes in distribution and abundance in response to warming temperatures are observed first. Cooper, Sam. 1984. “Habitat and Size of the LeConte’s Sparrow’s Territory.” Loon 56: 162–165. Igl, Lawrence D., and Douglas H. Johnson. 1995. “Dramatic Increase of Le Conte’s Sparrow in Conservation Reserve Program Fields in the Northern Great Plains.” Prairie Naturalist 27: 89–94. Johnson, David H., and Lawrence D. Igl. 2001. “Area Requirements of Grassland Birds: A Regional Perspective.” Auk 118: 24–34. Kuyava, Gary C. 1962. “Nesting LeConte’s Sparrows in South St. Louis County.” Flicker 34: 26–27. Madden, Elizabeth M. 1996. “Passerine Communities and Bird-Habitat Relationships on Prescribe-Burned, Mixed Grass Prairie in North Dakota.” MS thesis, Montana State University. Parmelee, David F., and Richard J. Oehlenschlager. 1973. “Status of LeConte’s Sparrow in Minnesota.” Loon 45: 131–132. Peabody, P. B. 1901. “Nesting Habits of Le Conte’s Sparrow.” Auk 18: 128–134. Tester, John R., and William H. Marshall. 1961. “A Study of Certain Plant and Animal Interrelations on a Native Prairie of Northwestern Minnesota.” Minnesota Museum of Natural History, Occasional Paper no. 8. Minneapolis: University of Minnesota Press. Walkinshaw, Lawrence H. 1968. “Passerherbulus caudacutus (Latham). Le Conte’s Sparrow.” In Life Histories of North American Cardinals, Grosbeaks, Buntings, Towhees, Finches, Sparrows, and Allies (Order Passeriformes), edited by Arthur Cleveland Bent. Smithsonian Institution Bulletin 237. Washington, DC: U.S. National Museum. Winter, Maiken, Jill A. Shaffer, Douglas H. Johnson, Therese M. Donovan, W. Daniel Svedarksy, Peter W. Jones, and Betty R. Euliss. 2005. “Habitat and Nesting of Le Conte’s Sparrows in the Northern Tallgrass Prairie.” Journal of Field Ornithology 76: 61–71.